Gallery 446 presents WINK a photo collective in the exhibition Wet & Dry. The exhibit runs through May 25 at 444 S. Indian Canyon Road. WINK members include: Aline Smithson, Alison Turner, Bootsy Holler, Claire Mallett, Jamie Johnson, J.K. Lavin, Lisa McCord, Marian Crostic, Marjorie Salvaterra, Nancy Baron, Robert Bright, and Sarah Hadley. Each member of WINK exhibited several photos, with the exception of Robert Bright, who only had one photo showing. 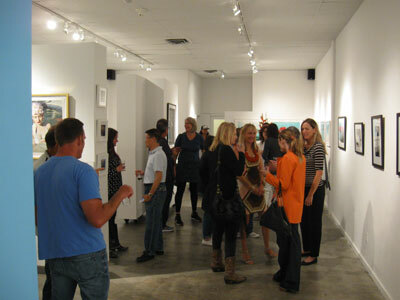 Overall, it was a fine show of work in a variety of styles, all sticking to the themes of wet and dry. 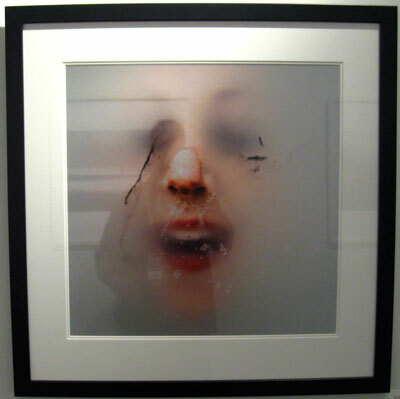 My favorite photograph in the show was Dissolve by Alison Turner, a 19″x19″ image printed on metallic paper of a female face submerged in water with only the tip of her nose above, with black streaks of what could be eye shadow or mascara suspended in the water. Throughout the opening, I kept returning to look at this mesmerizing photo. I had a difficult time getting a decent shot of Dissolve due to the reflective surface and inadequate lighting. This snapshot doesn’t do justice to the image. Nancy Baron exhibited three small landscape photographs. My favorite was titled, Desert Moon. These pieces were different than I have previously seen of Nancy’s work and found these small works to be soothing. Marjorie Salvaterra exhibited some of the work from her series, HER, for which, a book is also available. Information can be requested from Marjorie through her website. 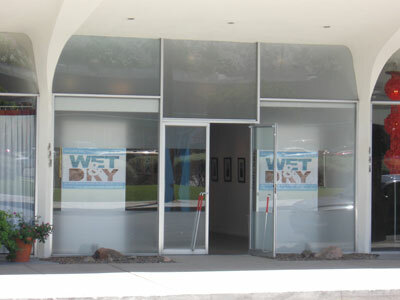 Wet & Dry at Gallery 446 in Palm Springs. This entry was posted in Exhibits on May 4, 2014 by Ray.